This is what Dee draws for today. That’s me (the big one) and her (on left side of the big one) inside the big circle, she said. And what’s your story, Dee? Dee asked me to teach her how to made the boats and a pirate hat from unused brochures and a piece of old newspaper. “Well sure, why not,” i said. “Can we play it together?” she asked. I had a deadline coming up, but she had no one to play with except me, and i didn’t want to disappoint her. After all that was finish, we played the pirate, i am the pirate and she still held her role, as pirate’s daughter. And guess what, even a quiet man can do sword dance if his little daughter requested him. A simple request from a daughter and a simple moment on a simple day of a father have delivered, i still had enough time to meet the deadline and even made this picture. I watch her as she sleeps, a smile, a beautiful smile on her lips complete my perfect evening. By my side. 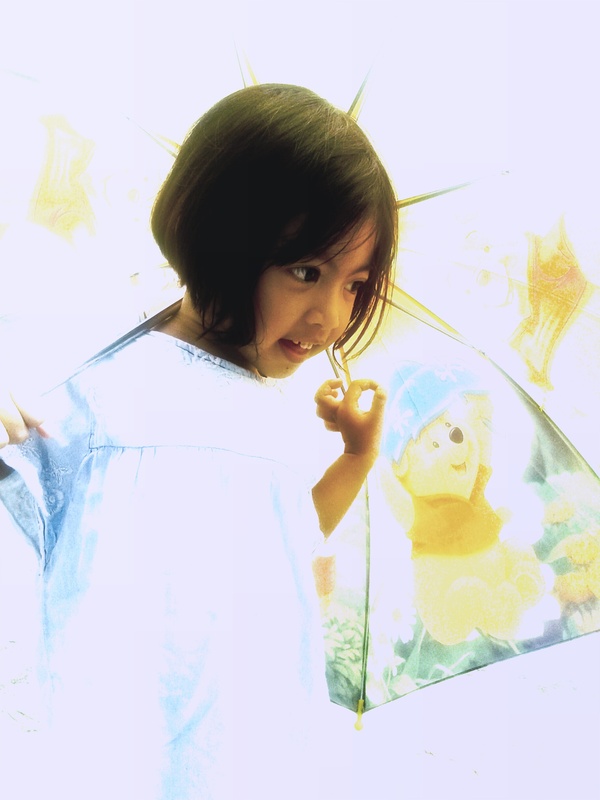 Dee with her umbrella.